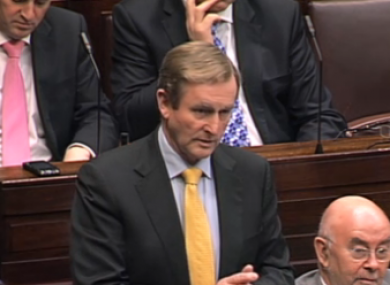 Enda Kenny says it’s only six weeks into the year – and too early to predict the promissory note impact on Budget 2014. ENDA KENNY has said it is too early to predict how the terms of Budget 2014 will be influenced by last week’s deal liquidating IBRC and scrapping its promissory notes. The deal is due to reduce the government deficit by about €1 billion next year, by abolishing the promissory note and instead issuing long-term government bonds which carry a lower annual interest burden. There is no immediate benefit to the Exchequer for 2013, as the costs of liquidating IBRC offset any savings – but the €1 billion saving could be used to avoid some of the €2 billion of spending cuts, or €1.1 billion in tax increases, that the Irish public should expect next year. “We’re only six weeks into the year,” Kenny told independent TD John Halligan in the Dáil this afternoon. Further adjustments of €2 billion are expected in Budget 2015, with €1.3 billion in spending cuts and €700 million in tax increases. Kenny said the deal would nonetheless had “an impact upon our growth, upon our debt position, and upon our deficit – as a consequence leading to jobs and stability and falling unemployment,” he said. Email “Government yet to decide how €1bn prom note windfall will be spent”. Feedback on “Government yet to decide how €1bn prom note windfall will be spent”.